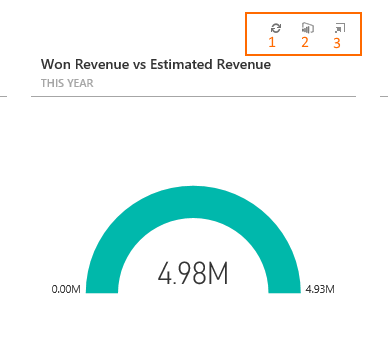 Create rich, interactive reports and real-time visualizations in Dynamics 365 for Customer Engagement with Power BI dashboards and tiles that you add to your personal dashboards. Follow these steps to add a Power BI dashboard to Dynamics 365 for Customer Engagement. If you are connecting to the Power BI service, you need an account and to have selected your Dynamics 365 for Customer Engagement instance as a data source. For more information about registering and connecting data sources, see Microsoft Power BI. 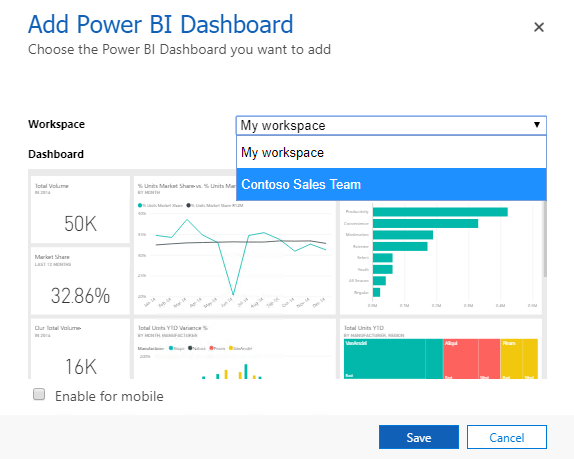 In the Add Power BI Dashboard dialog select the workspace and then select the Power BI dashboard that you want to embed in your dashboard in Dynamics 365 for Customer Engagement. Select Enable for mobile if you want to make the dashboard available for Dynamics 365 for tablets and Dynamics 365 for phones. Follow these steps to add one or more Power BI tiles to your personal dashboard. If you are connecting to the Power BI service, you need an account and to have selected your Dynamics 365 for Customer Engagement instance as a data source. 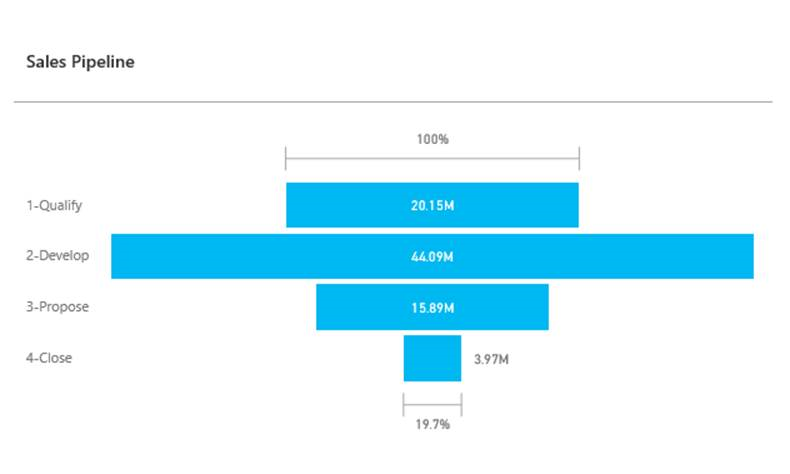 For more information about registering and connecting data sources, see Microsoft Power BI. To share your personal dashboard that contains Power BI visualizations you must configure sharing in both Customer Engagement and Power BI, and the user or group must have the same credentials and appropriate level of access in both services. To share your personal dashboard in Customer Engagement, go to Sales > Dashboards. In the list of dashboards, select the personal dashboard you want, and then click SHARE DASHBOARD. For more information about sharing a dashboard in Power BI, see Power BI: Share a dashboard with colleagues and others. By enabling the embedding of Power BI tiles and dashboards, when a user embeds a Power BI tile or dashboard, that user’s Azure Active Directory authorization token for Dynamics 365 for Customer Engagement is used to authenticate with the Power BI service with an implicit grant, providing a seamless “single-sign on” experience for the end user. An administrator can disable embedding of Power BI tiles and dashboards at any time to stop use of the Dynamics 365 for Customer Engagement authorization token for authenticating with Power BI service. Any existing tiles or dashboards will stop rendering for the end user. The Azure component or service that is involved with embedding of Power BI tiles is detailed in the following section. This service provides the authentication token exchanged with Power BI service for API and UI authentication.